Will Russian Airpower Change the Geopolitical Map? When you think airpower most of the time you think the United States. That’s because in recent decades the United States has produced the best fighter planes in the world such as the F-15 and F-16. But is the American star fading and, if so, what about the Russians? American air dominance is due to the best airframes and engines, advances in radar and the design of air to air missiles. To make US fighter planes even more formidable, the US created the first true stealth aircraft meaning that typical radars (both ground and air-based) do not “see” the stealth fighter, or at least do not see it until it is too late to respond. US tactics are largely based on the success that Israel had in 1982 in the Bekaa valley over southern Lebanon when it destroyed more than 86 Soviet-supplied MiG and Sukhoi fighters, including the MiG-25 which, until then, was unstoppable. Israel used brilliant tactics and new technology including the first “look down-shoot down” radars which made it possible for Israeli jets to jump on lower flying MiG’s and Sukhoi’s. Because of US technology and the use of airborne warning systems such as the E2-C Hawkeye, Israeli planes could coordinate their attacks and share radar targets; thus not all the planes needed the advanced radar to get kills. Israel also had the advantage of the AIM-9L air to air missile. This is the first “all aspect” air to air missile meaning that the missile could be launched against the enemy even in a head-on encounter. Typically air to air missiles could work only when a fighter was behind the enemy and the missile seeker could lock on to the jet exhaust. AIM-9L changed all that and any angle of attack would do, meaning that US aircraft flown by Israel had a considerable advantage. The Israeli attack was also predicated on knocking out the enemy’s ground radars, something that was accomplished in around ten minutes using tactics that are still classified. Unlike the war in Vietnam where ground radars and surface to air missiles played havoc with American fighter-bombers, or the 1973 Yom Kippur war where a new generation of mobile SAM missiles (such as the SAM-6) did a lot of damage to Israeli aircraft and took away their air superiority over the battlefield, the Bekaa valley action was made possible by the destruction of almost all of the Soviet-supplied radars and missiles. Some, but not all these lessons went into the US program to create 5th generation fighters to replace the F-15’s and F-16’s that were 1970’s airplanes. The fifth generation aircraft use stealth technology to hide the plane from enemy radar rather than the Israeli approach which was to liquidate radar and missile ground threats. With the advantage of stealth technology, the US also decided to optimize the aircraft with advanced sensors and with long range missiles, setting up a scenario where the enemy does not see you coming and is shot out of the air before he knows what’s happening. Or at least that is the scenario. Every aircraft is built with a lot of tradeoffs, both aerodynamic, electronic and cost. The US first stealth aircraft was the F-117A. To keep it stealthy it was not supplied with an afterburner, meaning that it was confined to subsonic flight operations. The airplane did not exactly perform as hoped. At least one of them was shot down by Serbian forces who were able to figure out how to track it on radar anyway, and at least one, perhaps two others were hit by ground fire over Yugoslavia and had to make emergency landings. Even against Iraq where the F-117A was again used, its bombing accuracy was never as good as advertised, and in any case it flew with more capable conventional aircraft including the F-15, F-16 and F-18. The crown jewel in the US aviation inventory is the F-22. This is a super-stealth aircraft with advanced electronics and super cruising capability. The F-22 has never been used in combat, so no one really knows what its vulnerabilities may be, and at over $400 million per copy it may be too expensive to lose. Add to that two other factors: the airplane already has been around for a long time giving opponents time to figure out countermeasures, and the F-22 program was canceled when less than 200 of them were manufactured. Congress also made the F-22 problematic when it put in place legislation forbidding the foreign sale of the plane, which may have helped mitigate costs per plane. While it was terribly expensive and only something for rich countries, there were some with the dollars and the need who were willing to buy it: for example Japan wanted it as a strategic answer to China. No dice. Instead the US came up with the expensive and questionable F-35 program which, so far at least, has not met its goals and is delayed in entering service, notwithstanding the claims that it is operational but in practice useless until the program is fully executed. The F-35 is the only 5th generation aircraft the US has for export, and while it is being bought by Australia, the UK, Canada, Italy, Israel, Japan, Korea, Denmark, Turkey and the Netherlands, though the numbers are small and there is growing controversy about the plane, so much so that the Canadian Liberal opposition wants to cancel Canada’s participation, and in Australia there is growing angst over the plane’s utility and cost. The F-35 is half a stealth because its tail end is not stealthy and whenever it opens its bomb doors it lights up radars allowing them to paint the F-35’s track and intercept it. And the F-35 is not maneuverable; it cannot outfight previous generation aircraft if the planes are reasonably close to each other. It depends on long-range missiles to knock out the enemy. Whether long range missiles can be jammed or fooled remains an open question. If they can be, as may be the case, then the entire F-35 investment (overall more than a trillion dollar program) goes down the drain. The US does not have a fallback or alternative. All weapons systems have half-lives, including air to air missiles and stealth. As the surprise and punch of the enemy system wear off, the system must be adapted. As things now stand, the F-35 platform is nonadaptable meaning that the only place where it can be improved is the air to air missiles and electronics such as radars and jammers. Enter the Russians. 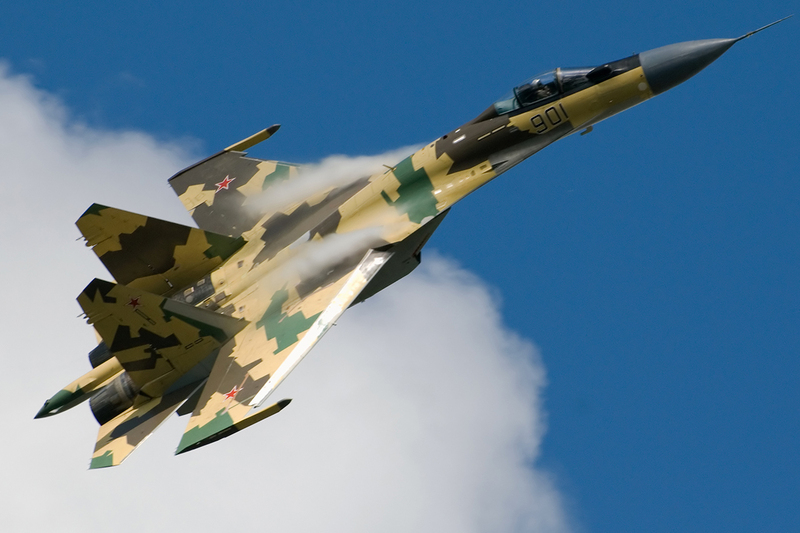 The Russians take a different approach in both their MiG and Sukhoi series of fighter jets. Instead of an entirely new platform each time, they build variants, upgrades and new platforms from existing ones. This has considerable advantages: it lowers development costs because proven components are reused; it allows test and development of new components on older platforms; it reduces risk and it sustains competition between MiG and Sukhoi, the two major design bureaus working on fighter jets. In the US case, the F-16 was an entirely new platform owing next to nothing to its predecessors. Ditto for the F-15 and double ditto for the F-22 and F-35. While some of the same weapons might work between aircraft such as air to air missiles, radars, communications equipment and smart bombs, most of the rest is de novo development. And some of the newer platforms such as the F-22 and F-35 probably can’t be grown much further than where they are at the start. Thus, the Russians have more flexibility. They also have strong export prospects and some of their exports carry with them a geopolitical risk in that the Russian aircraft can alter the balance of power. Consider the Su-35, which is considered a 4++ generation aircraft (the F-22 and F-35 are fifth generation aircraft, or so they are claimed to be). Pakistan, which relied on both the US and China for airplanes is now in conversations with the Russians for the Su-35, although some think it won’t happen only because India will complain. As India is a far more important customer than Pakistan ever will be, the critics of a Pakistan-deal may be right. But the fact that the Russians are even open to such a conversation indicates they are aggressively seeking new markets. One country likely to get Russian fighters, and which will be a game changer, will be Iran. Officially the arms sales sanctions are on their way to be lifted, and all the arms makers are flocking to Iran, including American ones. But Iran will never get anything from the US for their own ideological reasons and because the US Congress would block any transaction. The Russians have something to sell, and they are ahead of their main competitor, China, in having the operationally ready equipment. If the Iranians wanted the Su-35 they might be able to get it, and it would irretrievably change the balance of air power in the Middle East as the Su-35 is more capable than the F-15 or F-16, the two top American planes in the hands of Saudi Arabia and Israel. Worse still, the US only has the F-35 to sell, and it won’t be able to deliver any for a number of years. Which plane is better? That is an open question, but in recent tests between an F-16 and the F-35, the F-16 performed better. Israel is in line to get the F-35, but it is some years out and Israel’s participation was not as voluntary as it may have looked from the outside. In any case, for Israel and probably for Saudi Arabia too, aircraft from the US or Europe are the only options currently on the table, and there is a lot of concern all around. The most likely outcome is that some of the long range classified weapons planned for the F-35 are going to need to be put onto older F-15’s as upgrades, hoping to be able to level the odds against what the Russians can put in the field now, not in the indeterminate future. Meanwhile the US better think about tempering its refusal to supply Taiwan with up to date F-16’s and reconsider how it approaches Egypt, where for a time the US stopped F-16 deliveries. The Egyptians are negotiating both with the French and the Russians for better fighter jets -in Russia’s case it is the upgraded MiG-29M and M2. President Vladimir Putin knows the value of Russian aircraft in reinforcing air superiority. The recent introduction of high value MiG’s and Sukhoi’s in Syria but piloted by Russians keeps the United States out of much of Syrian airspace if the Russians so choose to play the game that way, and poses a challenge to Israel that needs to control supplies to Hezbollah and counter Iranian operations inside Syrian territory. That is why Netanyahu flew to Moscow with his military and intelligence chiefs, trying to cut a deal with the Russians. Netanyahu’s visit to Putin should tell us a lot. The days of American air superiority are over.